So you have an idea that will provide huge value to an industry via a blockchain network. Well, now you have to convince others to join in. That should be easy, right? WRONG. The business models around a blockchain can be fundamentally more challenging to construct than the writing of any code. This blog is dedicated towards helping you think through how to form a robust cohesive network where everyone is incentivized to contribute. After you have determined whether indeed your use case is a good fit for blockchain- ‘TRUST’ being the term that must keep coming up again and again- then consider using a design thinking process. Step 1) Get everyone in the same room. You as the founder need to bring organizations to the table to negotiate how this might work. Oftentimes the mere allure of going to a design thinking session to learn about how blockchain can affect their industry will be enough of a carrot to bring them to the table. This curiosity may not hold for too much longer. Consider using the incentives framework in this blog to proposition your would-be network members prior to the meeting. You can have 3rd parties host and curate these design thinking workshops for you if needed. Many networks are choosing to opt-out of rehashing what the As-Is Business model is because they do no wish to anchor the group into old-school thinking. They jump directly into the To-Be Model. Ensure to include which network members have access to which data sources that would ‘feed the system’ and provide new value that would not have been available before. Future vision – how you pitch the future direction of the solution will likely sway adoption of it. For example, should your use case be one that positively impacts people or the planet as a whole, consider associating your idea with one of the 17 United Nations Sustainable Development Goals where appropriate, making it easier for other similarly minded disruptors to find you. Here is where things might get tricky and where it would behoove you as the founder to think through before pulling everyone into the room. Making sure you devote enough time and energy into understanding what motivates and drives each of your network members, what their pain points are, and to really empathize with them will help you structure a dynamic incentives structure that will build a cohesive network. Remember, the value only comes when the network is compelled to join forces. So this investment in time has to be made a priority on your planning efforts. Clients are willing to pay for a service that is newly made available due to the aggregated insights coming from the blockchain network. If users are a government owned entity and thus cannot be profitable, they need to be gleaning a cost savings through blockchain network participation. If they are NOT a government owned entity, a founder needs to consider if by participating, they are offered a service that helps them control their own data in some way. 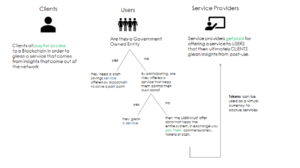 There are instances where service providers would also get paid by clients for offering a service to users that then ultimately helps clients glean insights. This payment can be measured through the use of tokens. This incentive structure actually needs to be built in a dynamic way as new groups join because incentives may change over time. You have landed on an incentive structure that everyone feels good about, so the MVP has begun. We have found that MVPs do not generally generate revenue off the bat. They are more about cost-savings. Consider building a roadmap that might start a pilot off with cost-saving measures but evolve into something that does indeed generate revenue for key parties involved. 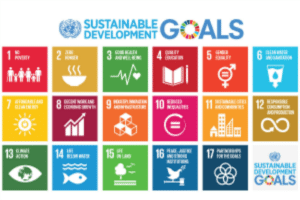 In the education use case above, a disruptor could mine for other like-minded individuals that are fighting for a mindset change in schools by indexing the 4th United Nations Sustainable Development Goal of Education, ‘Quality Education’. Easy and global access to a quality education is a key tenet of the 4th UN SDG. Whenever you want to post about your disruptive idea, use the hashtag #sdg4 and #globalgoals. When you present about your idea, don’t lead with the technology, lead with the To-Be state, your vision for how the industry will be disrupted and why it needs disruption. Oftentimes that comes with a cultural transformation, a mindset shift. Below is a sketch that was shared with me by a NC educator upon hearing my blockchain-enabled skills ledger keynote that I made to the Dept. of Public Instruction where I presented this culture shift. Although I did talk about the technology, I lead with what it would mean for school systems and students and followed it up with a Design Thinking session on how to encourage the mindset shift in stakeholders. A Design Thinking session for this use case could be held with a pilot school system or an association of school systems along with EdTech companies and others that are seeking to locate employees with specific skill sets. For this example, resource-strapped schools are incentivized to participate because they are required to offer school credit for students to learn skills that they may not be able to afford or find. Schools offer credit to students who take online courses teaching skills like ‘Drone Maintenance’, ‘Cyber-Security’, or ‘IOT’. Students want to get credit for as many skills as they can capture both inside and outside of the classroom and have their data live outside of any single school system. Schools and students in this case are users. EdTech companies are the service providers that are paid to curate content that clients want students to learn as they need to recruit. Clients would fund this blockchain as they reap value from finding skilled employees. EdTech companies get paid for creating great online courseware. Students can use an application that stores their course credits and skills learned over time irrespective of institution on a blockchain. Having easy access to own data, students would be incentivized to participate. Since this data contributes back to the larger system the network would pay them commensurately based on how much of their data is used in order to create value. Here is the rub though….the value of blockchain sometime takes time to create. In this same example, the client, in this case recruiting companies, won’t be able to mine data for a group of people that has the skill sets they seek until the system is up and running for a period of time. Schools and students need to sign up, EdTech partners need to get on the system and be vetted by clients, etc. There needs to sometimes be an upfront investment that then is realized over time as data is mined and value is realized. Considerations like certification of the content, pricing and other factors need to be analyzed as part of the workshop. Without engaging and well-scripted Edtech applications residing in this ecosystem, it may as well be a desert with tumbleweeds. Technology companies could use business models like this to post curriculum that we think is important to fill new collar jobs (like quantum computing, IoT, cyber-defense, design thinking, systems thinking, cognitive, cloud, etc.) in both traditional and non-traditional learning spaces. Phaedra Boinodiris is a member of IBM’s Blockchain team and is passionate about Tech for Good. Since the start of her career at IBM she has been a Developer Advocate and IBM’s global lead for serious games and gamification. She is also the author of Serious Games for Business, published in 2014 by Megan-Kiffer press. Boinodiris was honored by Women in Games International as one of the top 100 women in the games industry. In November of 2015, Boinodiris was elected as a member of IBM’s Academy of Technology and has 6 patents in the gaming space. 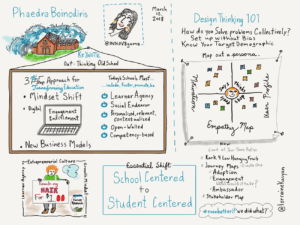 Boinodiris spoke at this year’s THINK conference in March on the subject of Re-Inventing K-12 Education.